It’s Official: PCX 125 to U.S.
Also via the Scoop: As we expected last September, Honda has added the new Thailand-made PCX 125 to their USA lineup. The US model is unlikely to feature the innovative (and probably overrated) gas-saving feature that stops and restarts the engine at lights. It looks like a great bike, but will customers be willing to pay a premium price for a 125cc scooter in a country where there’s no 125cc licensing restriction for beginners, especially when some great 150cc and even 200cc scooters with similar features are available? Well, there are several states where the cutoff for a motorcycle endorsement is at or above 125cc (in Illinois it’s 150), and unfortunately not needing a motorcycle endorsement is a selling point for a large number of people. Honda’s Elite 100 goes for $2,999. 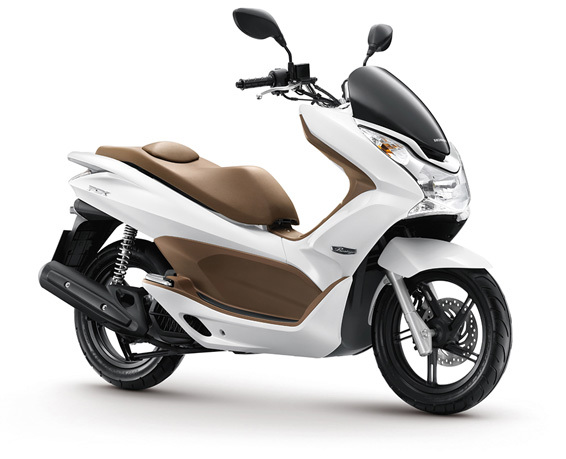 and the SH150i is $4,495, so if I were making a bet I would say Honda will price the PCX at $3,495, give or take. Where I live, you see a lot of Piaggio LTs and BVs and Kymco Peoples, so the look of it should be appealing. And it is a Honda, which means quality and a good dealer network. I don’t know why anyone would want a 125 here when the tests, taxes, requirements, everything but price and insurance, are the same (in practice, if not in name) as a hayabusa. And most states are similar to IL. I mean, aside from simply wanting a 125. There are reasons to ride a 125, but in most states, licensing requirements are not one of them. All that said, there seems to be a lot of excitement about this bike worldwide. It’s handsome, surely well-engineered, and I think it could be a winner, I just hope Honda doesn’t price it out of the market. Orin may see SH150s around, but I haven’t seen a single one on the road in Chicago in the year they’ve been selling them. I don’t think engine size is going to matter to people most likely to buy one of these. What will matter is fuel economy and a top speed fast enough for buyers’ intended use, which will probably be running around in cities and inner-ring suburbs. Speaking for my own blog, the post I wrote about the PCX after it rolled out at EICMA has been getting enough views since then to make it the third most-viewed on Scootin’ Old Skool (after Safety Ed’s damaged helmet and the how-to-shift video, which between the blog and YouTube has been viewed about 30,000 times). The point about expecting an automotive experience is very important. People expect to just buy and drive without thinking further for many thousands of miles other than oil changes. But maintenance issues always arise more frequently and the illusion crashes. I left that alone. Eye of the beholder and all. The PCX just been launched in Barcelona for european markets. Here, in France, Honda let us know that 800 units where already booked. I rode one for two days and although I had doubt when I’ve discovered the first pictures, the PCX is quite more attractive in real life. Right, it’s quite small sized but there’s enough room for rider 1,85m tall. Assembly is seems quite good too but you’ll find low-cost-type screws just to remember why it’s quite cheap. Here, the price tag vary from 2200 euros (Spain, Italy) to 2390 euros (France), VAT included. Regarding the performances, 0-100m acceleration is better than the one of Yamaha’s Xmax 125. Top speed is 100 km/h (109 km/h indicated) and fuel consumption is around 2,6 L/100km. The “idling-stop” device is more interesting in the way it make the PCX silent when waiting for the green light than in its hability to really improve fuel economy. The storage bay under the seat is large enough to fit a standard full face helmet in. The styling is mostly liked over here but it may not suit US taste. Anyway, it’s very interesting for us to see Honda shipping batches of PCX to the USA.